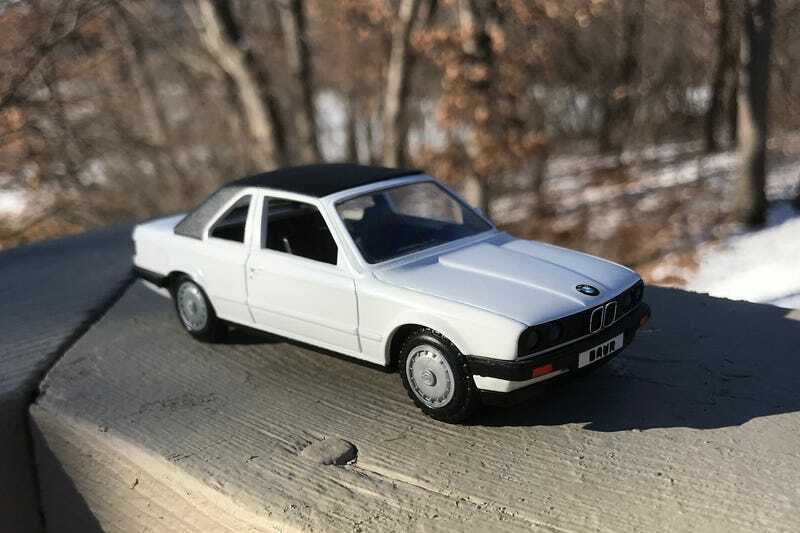 Finally scored one of these 1/36-scale (some claim 1/32) Cursor Modell BMW 3-series Baur TC2 Cabriolets at a reasonable price. People seem to think a lot of these on eBola and other venues, but this one was quite reasonable. Even though it lacks all packaging, it’s in perfect condition as far as I can tell. I like this casting since it’s metal and represents a pre-facelift E30, as opposed to the more recent Neo resin casting. The Cursor is old enough the chassis actually reads, “Made in W. Germany.” They were also apparently available in red, black, and silver. Eventually, I may disassemble it and paint it to match our 1984 323i Baur, pictured below. Have to get some better wheels. Kind of shame, at the ever-so-slightly larger scale, it doesn’t fit in the back of the 1/43 Schuco L6600 Mercedes-Benz transporter.